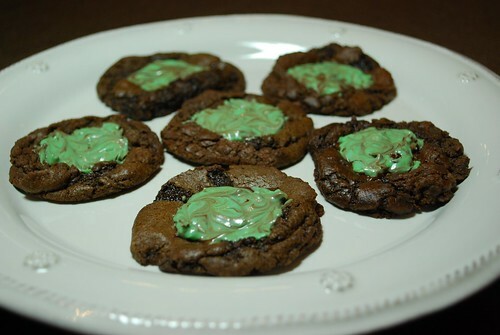 These are the perfect chocolate cookies, made only better by the molten chocolate mint candies that nest in the center of them. I am so glad that a friend recommended this recipe to me. You can tell just by reading it that it is a true retro recipe! 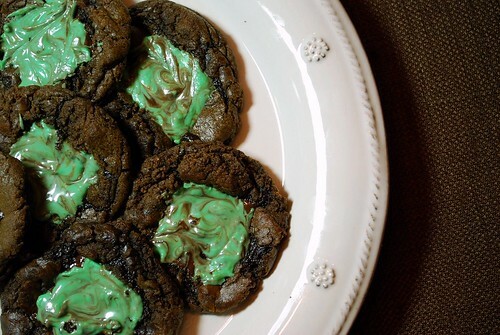 These chocolate cookies are chewy, with just a slight crunch around the edge. The texture is perfectly satisfying – chewy and gooey – and the mint centers melt in your mouth to make the perfectly decadent dessert after a weeknight meal. Their colorful swirls were a match made in heaven for our St. Patrick’s Day feast this week. In a heavy saucepan, heat the butter, the sugars, the molasses, and the water until melted and completely combined. Remove from the heat, and pour in the chocolate chips, stirring until melted and incorporated. Set the mixture aside to cool for about 15 minutes. Next, beat in the eggs, one at a time with the vanilla. In a seperate bowl, whisk together the dry ingredients. Gradually add the dry ingredients to the chocolate mixture, stirring until completely incorporated. Cover and chill the dough for at least one hour. Preheat your oven to 350 degrees and grease 2 large cookie sheets. Roll the chilled dough into walnut-sized balls, and place them about 2 inches apart on the prepared cookie sheets. Bake the cookies for about 8-10 minutes. 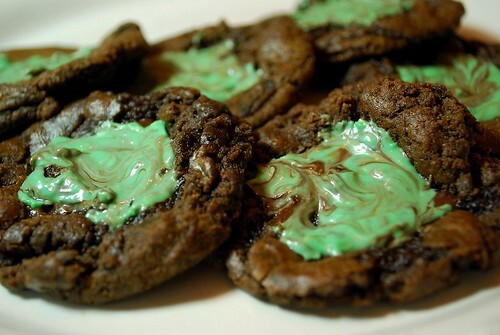 Remove from the oven and press a chocolate-covered mint candy into the center of each cookie. Allow the candies to melt for about 1 minute. Then, using a toothpick, swirl the mint portion of the candy in a decorative fashion. Remove the cookies to racks to cool completely. Yield 3-4 dozen cookies. Enjoy!